Can Neutering Unsocialized Cats Change Them? The older a feral cat is, the tougher it usually is to socialize him. Feral cats have not been socialized to people because they've experienced little to no contact with them. Though the furry felines look exactly like any typical household cats, they are not domesticated. However, neutering can be of great benefit to the wild and cute creatures. Taming feral cats is a difficult task -- a labor of love, if you will. In the case of kittens, however, it is certainly possible. Once a feral cat is over the age of 3 months old, socialization becomes increasingly difficult, though that definitely doesn't mean that you cannot try. If you are willing to put the time into working with a cat -- every day -- then you may be able to make progress in getting him to trust you. In some cases, it may take months or even years for a feral cat to allow someone to pet him. Dedication is a must. Neutering and spaying feral cats is very important. Even if wild cats are unable to adapt to life indoors, just getting them fixed helps keep feline overpopulation at a minimum. It also stops female feral cats from dealing with the nonstop physical stresses of carrying and giving birth to litters of kittens year in and year out. 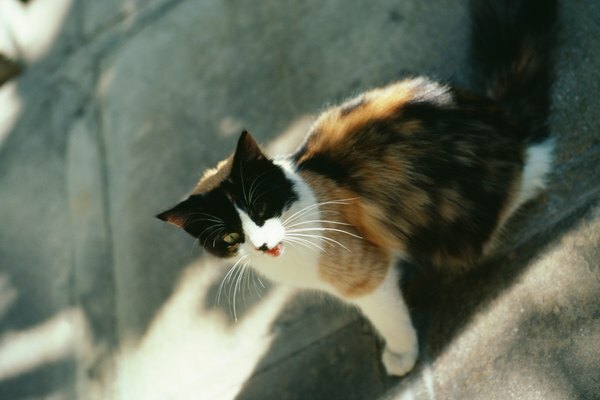 Even if you don't plan on adopting a feral cat into your home, you may want to research trap-neuter-release options in your area, from animal hospitals to charitable animal organizations. Neutering or spaying wild cats is unlikely to change their personalities in terms of socialization. Since these cats have been trained early on by their mothers to be afraid of people, the habits are deeply ingrained and probably won't budge, though it never hurts to try. In some cases, cats become more mellow and obedient with neutering and spaying. Formerly hormonally-driven queen cats no longer yowl through the night in search of area tomcats. Tomcats stop spraying urine to attract queens. Cats become less restless in general. Territorial fighting wanes. A feral cat's attention span and focus may improve, leading to positive behavioral changes. The better the cat's focus is, the easier a time you will have taming him. If you're planning to neuter an unsocialized feral cat, be careful. Since these cats are so frightened of people, they may instinctively scratch or bite you if you get too close. When dealing with feral cats, always wear long sleeves and thick, protective gloves. A humane cat trap is an effective and safe way to trap a feral cat. Once the cat is securely inside of the cage trap, you can take him to the clinic to get fixed. Do Male Cats Need Pain Meds After Neutering? What Percentage of Neutered Male Cats Get Urinary Blockages? Does Neutering Your Cat Make Him Fat? Can Neutering Cats Cut Down on Urine Odor?